Photograph collection of webmaster 5113 & 5129 on railtour duty at Garve on September 22nd 1973. The fifteen year nine month career of D5113/24113 began with ten years & eight months allocated to Eastern Region depots before transferring to the Scottish Region for the remaining five years. Shortened fuel tank & full size water tank (shortened water tank fitted later). Circular gauge added to fuel & water tank. December 1961 to Thornaby (51L). June 1964 to Gateshead (52A). April 1972 to Inverness (60A). October 14th 1976 - stored serviceable. October 31st 1976 - stored unserviceable. 24113 was stored at Millerhill from October 1976 until moved on June 17th 1977 with 24112 to Doncaster Works, where 24113 was broken up during September 1977. Noted Darlington Works January 1962. Noted Derby Works May - July 1965. Noted Glasgow Works June 1970. 1st qtr 1975 Glasgow Works? During December Gateshead sent D5112 & D5113 to Thornaby in exchange for D5156 & D5157. On February 13th D5113 failed on the afternoon Leeds – Patricroft parcels somewhere in the Huddersfield area, D6863 assisted forward. BR Standard 70013 was again used on an RCTS organized ‘The Dalesman No 2 Railtour’ on June 16th. This tour departed Leeds with D7568 and nine coaches, 70013 taking over at Stansfield Hall for a run over Copy Pit and various lines between there and Carnforth. On the return D5113 replaced 70013 at Skipton for the run up the Grassington branch, the short loop there required skilful shunting to complete the run round maneuver. At this time D5113 was still in green livery with small yellow ends (curved upper corners), single BR double arrow centered on the side and retaining its original exhaust port. During September 5113 entered Derby Works for a repair. On outshopping the locomotive gained blue & yellow livery, it received a shorter water tank with the fuel & water tanks fitted with with circular gauges (both sides), two numbers (inboard) and two BR emblems (cabside) each side. However the locomotive retained its gangway doors & original exhaust port. On September 22nd the WRC Hebridean No.3 railtour (Inverness - Kyle?) was worked by 5113 & 5129. During October it was observed the footholds had been plated over, but the cantrail water filler was still extent. 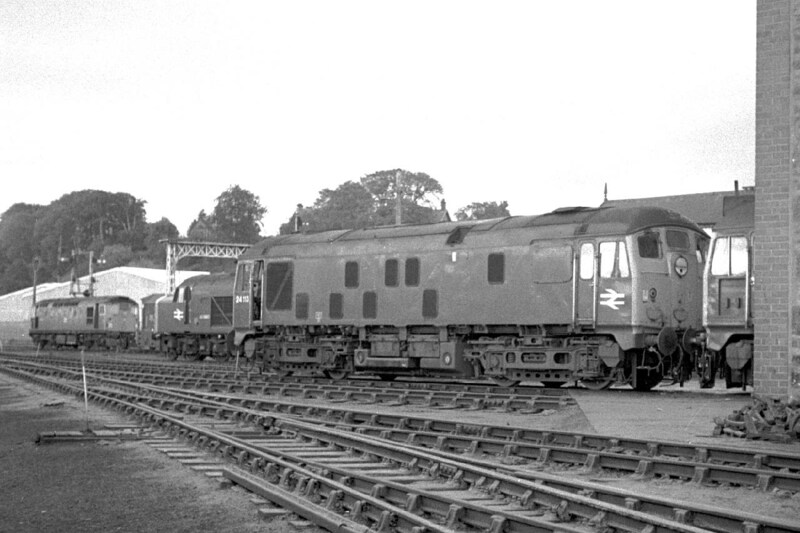 Photograph courtesy Tony Sayer 24113 at Inverness on October 2nd 1974. Traffic levels were increasing on the Highland mainline, brought about in part by the North Sea Oil boom. Unfortunately the singling of the main line during leaner times was now causing a constriction to traffic, although the greater use of Type 4 locomotives over the Highland route mitigated this somewhat. And even the bigger power encountered difficulties such as 47427 on February 5th’s Up ‘Clansman’ (10.30 Inverness – Euston) noted arriving at Perth with 24113 assisting, both being replaced by 47211. July 8th's 09.35 Glasgow - Inverness saw 24129 & 24113 taken off the train at Perth and replaced by 26036 & 26042. On November 1st 26039 (ex-works) & 24113 were noted awaiting departure from Glasgow Queen Street, possibly an Inverness train. 24113 was noted at Millerhill depot on November 8th, in company with 24106. This would be the last summer for the Scottish Class 24s with their demise imminent since more Class 25s were expected on transfer from the Western Region. On June 19th 24113 & 26012 worked the 12.15 Inverness - Glasgow. 24113 was noted running at Inverness on July 18th and was noted through Pitlochry on August 27th with a freight train including oil tanks. 24113 was stabled at Inverness on August 30th. 24113 was noted at Motherwell on September 4th, and was noted passing Motherwell on September 9th with a freight. The next day (10th) 26027 & 24113 worked the 20.25 Perth - Edinburgh. 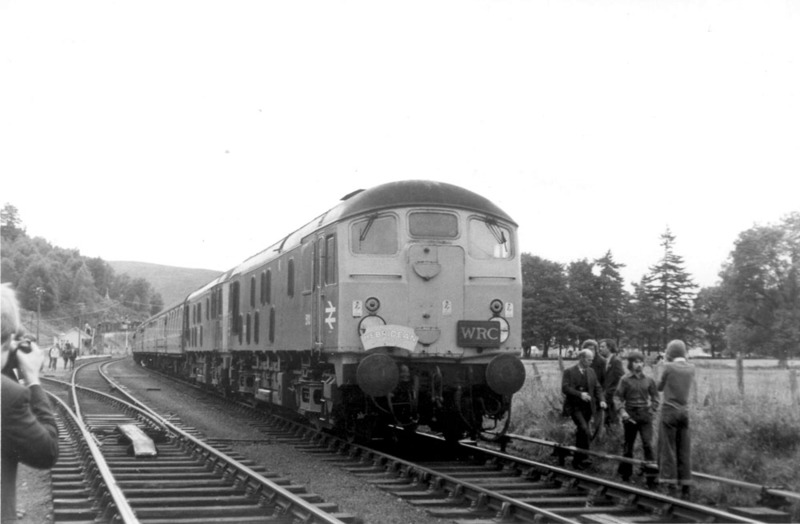 The same pair were noted the next day (11th) working the 13.10 Edinburgh – Inverness passenger. On October 14th 24113 worked the 05.55 Tyne Yard - Millerhill freight. 24113 was withdrawn on December 31st 1976. Page added May 1st 2016. Last updated April 12th 2019.